Is Islamic State Losing Ground But Winning the War of Ideas? FILE - Libyan forces prepare to detonate and dispose of explosives and shells left behind by Islamic State militants in Sirte following a battle, in Misrata, Sept. 9, 2016. The Islamic State terror group has been steadily losing territory in Iraq and Syria. But as the Caliphate shrinks, the group is shifting its emphasis to spreading its ideology, establishing outposts around the world, and attacking high-casualty, soft targets and economic infrastructure. Is the group succeeding in its broader struggle to build a resilient movement that endures despite its battlefield losses? Sometimes answering a simple question is a complicated task. 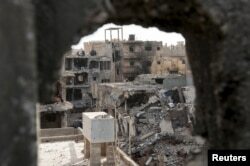 According to the latest IHS Conflict Monitor report, Islamic State lost about 12 percent of its territory from January to June of 2016, after losing 14 percent of its territory in 2015. The group still controls about 70,000 square kilometers; roughly the size of Ireland. Islamic State finances have also shrunk. Earlier this year, the U.S. Congressional Research Service reported that the terrorist group paid its soldiers from $400-$1,200 a month, as well as a further $50 for each wife and $25 for each child. 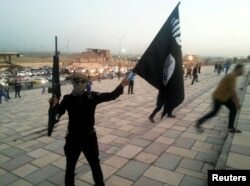 FILE - A fighter of the Islamic State of Iraq and the Levant (ISIL) holds an ISIL flag and a weapon on a street in the city of Mosul, June 23, 2014. According to some estimates, in 2015 Islamic State's assets were worth roughly $2 billion, which made it the wealthiest terrorist organization in history. However, after the U.S.-led coalition targeted its oil and gas infrastructure, financial networks and banks, the group’s revenue has dropped by at least 30 percent. Despite this loss of territory and income at home, IS still inspires like-minded factions abroad. Terrorist groups such as Ansar Bayt al-Maqdis in Egypt, Abu Sayyaf in the Philippines, Ansar al-Sharia in Libya and Tunisia, Boko Haram in Nigeria, the Caucasus Emirate in Russia, and the Islamic Movement of Uzbekistan, along with many others, have all pledged allegiance to Islamic State. The U.S. National Counter-Terrorism Center estimates that IS now has at least 18 operational affiliates in 18 countries — twice as many as the U.S. Department of State estimated two years ago. In addition to gaining affiliates, IS has also increasingly organized or inspired terrorist attacks around the world, including in Paris, Brussels, Nice, Ansbach, Orlando and San Bernardino. Islamic State winning, or losing? Douglas Ollivant, senior vice president of the Mantid International Global Strategic Consulting Group and former director for Iraq at the U.S. National Security Council, believes Islamic State will completely lose all of its territory by the end of this calendar year. Peter Bergen, vice president of the New America Foundation, agrees. The two argued at a recent event organized by the McCain Institute for International Leadership that those who believe IS is winning are falling into the trap of believing Islamic State's own propaganda. They believe if the group loses territory, it will lose the war. "ISIS is a geographic entity. That’s why they have attracted so many ‘foreign’ fighters,” Bergen said. Ollivant attributes increased attacks by the group – especially in the West – to Islamic State's diminished capabilities. “The only aspect in which ISIS has gained traction is in suicide bombings and inspired attacks…This is a sign of weakness, not strength,” Ollivant stated. Sebastian Gorka, vice president of the Institute of World Politics, disagrees, saying any attempt to measure success against Islamic State in conventional military terms is misguided. He said IS is a sophisticated, worldwide insurgency that measures success in terms of ideology, permanence and legitimacy — not territory. Gorka also noted that while fighting IS on the ground, its financial capabilities continue to be underestimated. “The attacks of September 11, 2001, cost barely $500,000. ISIS makes that in six hours! Do you feel safe?" In an interview with VOA, former assistant secretary of defense Mary Beth Long said such conventional thinking “is leading us towards the wrong conclusions.” The terror group continues to be successful in using the internet, social media and an online magazine to strengthen its brand, expand its influence and recruit new members. “At its core, ISIS is ideological. The battlefield is just one manifestation of how they see a return to the pure Caliphate and pure Islam,” she said. You cannot claim to have defeated them on a battlefield as long as you have “the continued existence” of the ideology globally, said Long. “ISIS has polluted our minds,” she added. According to the U.S. Federal Bureau of Investigation, of 110 Americans who tried to join ISIS and were detained, some 60 percent were between the ages of 15 and 25, and were inspired through online recruitment by Islamic State. “They are on the internet. They are on Twitter. They are raising ISIS cubs — children who know nothing but violence and purity of Islam. They will grow up to be people that we could not even communicate with,” she added. FILE -- In this photo released on April 25, 2015 by a militant website, which has been verified and is consistent with other AP reporting, young boys known as the "lion cubs" hold rifles during a parade after graduating from a religious school in Tal Afar, Iraq. Long believes that the United States needs to have a strategy to fight Islamic State ideologically. For now, the fight drawing the most attention is the one in Syria and Iraq, where despite its battlefield losses, Islamic State still retains its prized strongholds of Raqaa and Mosul. FILE - A militant Islamist fighter uses a mobile to film his fellow fighters taking part in a military parade along the streets of Syria's northern Raqqa province. While the war there grinds on, the debate in the United States continues about whether battlefield successes will translate into victories in the global struggle to eradicate the group's violent ideology.